Since the 1970s, conventional thinking about macroeconomics was consumed with the challenges of inflation control. This led to entrenched dogma surrounding inflation targeting and central bank independence. However, since the end of the financial crisis, there has been more discussion of the issues posed by slow growth -- although I believe that inflation control would come to the forefront if inflation rates started to rise again. In this article, I give a summary of why I think inflation will probably continue to remain relatively low in the developed countries, even taking into account what I see as politically feasible policy shifts. 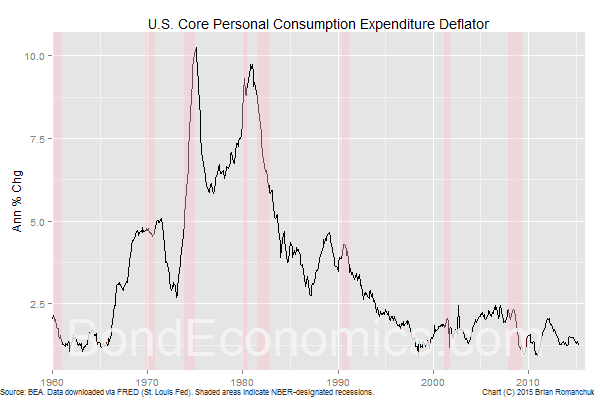 The chart above shows the "core" (ex-food and energy) rate of inflation in the United States, measured using the Personal Consumption Expenditure (PCE) deflator. (If we include energy prices, the trend is obscured by oil price spikes.) As is well known, the rate of inflation started to creep up in the 1960s, and then hit relatively high levels in the 1970s (roughly coinciding with oil spikes). Note that many developing economies routinely run higher rates of inflation, even the 10% peak would not be considered very high. Other developed economies had a similar experience to the United States, although the magnitude of the swing in inflation varied. Since the early 1990s, the core PCE inflation rate fell below 2.5% per year, and has stuck there, despite the cyclical swings in the economy. My view is that structural changes in the labour market have caused the disinflation since the early 1990s. This is based on the analysis found within the book Full Employment Abandoned: Shifting Sands and Policy Failures by William Mitchell and Joan Muysken. (I recently reviewed Bill Mitchell's book on the eurozone here.) Unfortunately, it has a ridiculous price, like other academic textbooks. The conventional view is that the disinflation is the result of virtuous central bankers pursuing anti-inflationary policies. These arguments are buttressed by models in which is assumed that central bank policy determines the inflation rate. I will leave it to the reader to decide how persuasive such self-referential arguments are. In any event, with policy rates having converged near zero pretty much throughout the developed world, the scope for conventional monetary policy is constrained going forward. In this regard, I guess what I'm asking is the following. Is there any way of avoiding using the blunt instrument that is monetary policy, with or without a JG [Job Guarantee] (although having a JG probably makes monetary policy less brutal)? Economic policies that are not easily characterised as "monetary" or "fiscal" matter for economic growth and inflation. This means we cannot just look at monetary and fiscal policies to make inflation forecasts. The decline of unionisation is plausibly related to lower wage inflation. To what extent this is the result of government policy, it cannot be traced to fiscal or monetary policy stances. Indexation of prices and wages to inflation will have turn one-time price level shocks (for example, from an oil price spike) into ongoing inflation. The decline of strong unions, as well as the reduced role of the government in developed economies presumably reduced the amount of indexation within the economy over recent decades. Trade policy has led to lowered prices of traded manufactured goods relative to domestically produced services within the developed economies. The economic effect occurred almost solely within the private sector, the involvement of the government was solely regulatory change. The Canadian housing bubble has been driven by administrative decisions taken by the Canadian Mortgage and Housing Corporation (CMHC) - at the behest of the Federal Government. There was a consensus across political parties that Canada needed to make CMHC policies more friendly towards the real estate sector, which entailed a significant relaxation of lending standards for mortgages. The bubble was thus unleashed. The Canadian economy could have been put on a more sustainable growth path by having kept more sensible lending policies. A tightening of standards has occurred has been attempted, but the question arises whether this was done too late. Although low interest rates helped the bubble form, it could have been controlled without affecting interest policy. The experience of recent decades shows that the developed countries have a policy mix that is consistent with low inflation. This has been achieved by suppressing wage inflation, leaving the economies with persistently high unemployment and underemployment (and in particular, youth unemployment). Until those structural factors change, it is probably safe to say that inflation will cycle around its current low level. Monetary Policy. Policy rates are stuck near the zero bound, and Quantitative Easing is largely pointless (except to the extent it can reduce spreads, such as the Fed purchase of private assets, or ECB purchase of peripheral debt). Monetary policy is going to be irrelevant for as far as the eye can see. Fiscal Policy. The developed economies can undertake mild expansionary fiscal policies (or austerity policies) without there being a measurable change in inflation. Peripheral European countries such as Greece have achieved mild deflation, but doing that required policies that would only make sense to European policymakers. Extremely expansionary fiscal policies could rekindle inflation, but such policies do not appear to be politically viable. Given the hefty underemployment present within the developed economies, the policies required to tighten the job markets would be well outside of the norms that we are accustomed to. In other words, a fiscal programme that would be widely described as "radical" would probably only be about half of the size needed to cause a measurable uptick in inflation. The Job Guarantee policy advocated by Modern Monetary Theory (MMT) is one of the few policies that I can think of that structurally change the economy while remaining coherent with other policies that favour low inflation. The belief that a Job Guarantee would not be inflationary would most likely be contested by its opponents. There certainly be a one-time price level shock, as the Job Guarantee would have strong interactions with minimum wage jobs. Some marginal employers that rely on poorly paid workers doing unpleasant jobs may no longer be viable. (This is exactly one of the objectives of the policy.) But once that initial bit of creative destruction subsides, there is no reason to expect wages to be under continued upward pressure -- unless the Job Guarantee wage is continuously raised. The implication being that aggressive indexation of the wage paid would have to be avoided if the objective is to contain inflationary pressures. Of course, fixing the Job Guarantee wage for all time would be unfair if the objective of the government is to deliver 2% a year inflation (or whatever). The wage could be periodically updated, but it leaves the programme hostage to political developments, such as we have seen with the minimum wage. A better solution appears to have an automatic growth which follows the level of the inflation target (for example, 2% per year). This way the wage level should remain relevant, but at the same time not act to perpetuate price level spikes. I'm bookmarking this post in my "classics" list! I would add a lot but will stick to one comment on your take on the JG, which I gather is the main point of this excellent commentary. I absolutely agree with you that a JG need not be inflationary. Indeed, its low inflationary properties were considered an advantage in the 1970s by Baily and Solow in their analysis of the macroeconomics of the JG (or public service employment, as it was called then) The problem, in practice, is that mist jobs offered under the program were actually fairly high skilled, which meant they took workers away from private employment, and contributed to the inflation problem at the time. The macroeconomics of a JG are sound. Its practical application and administration are the challenging aspects. You state it nicely above. However, just a quibble, I'm not sure the extent to which fiscal policy drives recent (say, post-1990) inflation. I think its role has been too small to matter much. I'd limit it to the state of employment and wages. With regards to your point about fiscal policy determining inflation, I would characterize it as determining the general range of inflation, but not the exact level. For example, I would characterize fiscal policy as being stable and relatively tight, and keeping inflation closer to 2% than 10%. But once we know that it is around 2%, we need to look at the other factors as to why it is 1% instead of 3% (for example). And since places like Canada and the United States have had inflation stuck in that tight range since the early 1990s, fiscal policy does not tell us much about the wiggles over that period. (a) Central bankers are conservative (in some sense of the word), and inflation-phobic by nature. Central banks are also the major sponsors of macro research. (b) The political right swept into power based on the "radicalisation of the middle class" (in the words of George Will) that was created by inflation. It is a natural area of strength for those parties, and so they will always rally around the anti-inflation flag. (c) The rise of Real Business Cycle models was based on their alleged superiority in dealing with the stagflation of the 1970s. Since those models have no other empirical successes, they have to keep going back to the stagflation story. I would agree that it has not been very hard to keep inflation below 3%. In my view, the central banks are taking credit for something that would have happened anyway. I think the reason why they would not embrace a 4% inflation target is that they would probably not be able to hit it. (This is because of nominal rigidity near 0% inflation; I gave a simple model here: link to "Using Nominal Rigidity To Improve An Inflation Model." Remember, banning (useless) things (e.g. luxury goods) and cutting bank lending can be used to free up real resources.